In its continuing efforts to fight poverty and hunger, the Nigeria Agricultural Transformation Agenda Support Program – Phase 1 (ATASP-1 Outreach Program) unveiled a new tractor and other farm implements on 12 September at the IITA Onne Station in Rivers State, Nigeria. Head of IITA Abuja Station and ATASP-1 Outreach Coordinator Gbassey Tarawali presented these at an official ceremony witnessed by the Head of Onne Station Richardson Okechukwu, along with other management and station staff. 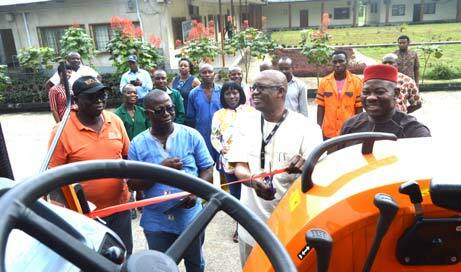 Gbassey Tarawali cutting the ribbon as staff members look on. Tarawali was accompanied by ATASP-1 Monitoring and Evaluation Specialist Rogers Sheik as he presented the new farm machinery which included a chisel plow, disc plow, planter, and boom sprayer, all funded under the ATASP-1 Outreach Program to eliminate drudgery and increase efficiency in research work. In his welcome address, Okechukwu stated that he was pleased to receive Tarawali back “home” and expressed optimism that the Onne station will put in more effort to ensure it becomes the pride of IITA. He also noted that this was the first time personnel from Abuja visited the station.